Whether you need personal or business banking, we have been helping Arkansans follow their dreams for decades. We are here, and we know you – so you can bank with trust. 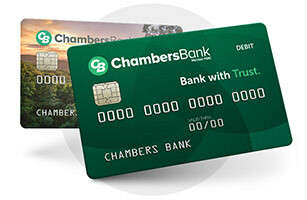 We are a full service community bank, but relationships are what set us apart. And every relationship starts with trust. Our Arkansas roots grow deep, and you can trust us as your partner for every banking need. Family-owned in Arkansas since 1930, we have 18 branches throughout the state. In a busy and connected world, it is still important to know and trust your banker. And that makes us the natural choice for the Natural State. We are more than just a community bank. We want our communities to be strong and growing, and we are committed to doing our part as your bank and as your neighbors. Copyright © 2019 Chambers Bank. Member FDIC. All Rights Reserved. You are about to visit a third-party site not operated by Chambers Bank, a FDIC-insured institution.